It was the change of shift. But our charge nurse got a call from one of the female units and wanted to send a pregnant inmate, complaining of abdominal pain. Five minutes later, the young female came in with a waddling kind of walk. She was pregnant for 6 months now. “Ma’am, I have bad cramps”. After taking her vital signs, I found out everything was normal. Together with a co-worker, we assessed the baby’s heartbeats, using the Doppler monitor. Her tummy started moving around which was a good sign that the baby was kicking inside her and the heart beat was fine and within a normal range. I had her get up and gave her a little cup. “Okay, Ma’am”, she responded as she slowly made her way toward the bathroom for the female inmates. After doing the urine UA [Urinalysis] dipstick, it showed some presence of bacteria and mild amount of blood. “Ma’am, how many cups of water a day do you drink?” I asked. “Not so much. Sometimes, I don’t,” was her reply. “No wonder. You will have cramping from having a bladder infection. You will need antibiotics. So I just want you to remain sitted in the waiting area until our jail doctor gets here and examine you further. More likely, the doctor will give you antibiotics and tell you to drink a lot of water!” I explained. I’m sure this inmate had learned a painful lesson of not drinking enough water, especially in her condition of being pregnant. The spasms could really be awful if she had a bladder infection. Worse yet, if she became dehydrated, that could have been life-threatening to her and the baby inside her womb! When Jesus met the Samaritan woman at the well, He told her of the living water that He could supply [John 4:10-15]. Christ invites anyone to come and drink of the water of life. Salvation cannot be earned. God gives it freely. 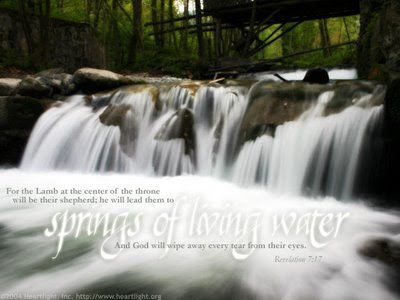 We are living in a world desperately thirsty for living water. Many are dying of thirst. As Christians, we can choose to advice and tell others who are thirsty that there is a living water that gives life!